I’ll probably include this information on my post for the San Antonio Zoo, but I’m going to put this here just so that I have it in the blog until such a time as I can update the post. Or maybe I’ll just link this post there. Actually, now that I think about it, that’s probably the best way to go. Lucky the elephant is no longer all by herself in her enclosure. As of today, the San Antonio Zoo has taken on a middle-aged Asiatic elephant named Nicole. Nicole was formerly a performer with the Ringling Bros. and Barnum & Bailey Circus. The zoo says that they matched Nicole with Lucky by comparing their personalities, sort of like a dating app, I guess, and they hope that the two will turn out to be compatible. One thing in Nicole’s favor is that she is a former circus elephant. This means that she is already socialized to humans and should pick up the routine at the zoo pretty quickly. Let’s hope that the new roommates hit it off and have a long friendly association together. This post is due to go live on June 27. I had hoped to go to the Witte Museum on June 21 to take pictures and then write that post. It is now June 19 and I haven’t made that trip to the Witte yet. So, since I did finally get to the San Antonio Museum of Art (“SAMA”) for a very, very fast trip (40 minutes!) on June 5, let’s do that instead and then I’ll visit the Witte on Tuesday and get some pictures and post that article on what looks like July 5. Meanwhile, I have another National Geographic issue to get to reading. I have been going to art museums for just about as long as I can remember. So, again, once we moved to San Antonio, the now-ex and I had to check out the art museum. I think it took us a couple of years, but it was well worth it. And one Alex was born, we started going even more often. SAMA has the usual portraits and landscapes and modern art (they have a Warhol soup can (Pea Soup, I think) somewhere; the last time I could find it, it was near the entrance to the auditorium). But the two areas that the museum is best known for are its collections of Latin American and of Asian art. In 1998, the museum opened the Nelson A. Rockefeller Center for Latin American Art (you can just see the leftmost edge of this addition in the far right of the image above). Nelson A. Rockefeller was grandson of John D. Rockefeller, the founder of Standard Oil (which was later broken up into various companies including ExxonMobil (which used to be two companies)). Rockefeller also held a number of government positions, most notably as Vice President under Gerald Ford from 1974 until 1977. In his private life, however, Rockefeller was an avid art collector. One of his favorite things to collect was pre-Columbian and folk art of Latin America. After Rockefeller’s death in 1979, his heirs began searching for museums to display his art, and San Antonio became home to 2,500 pieces. Not all of the art in the center is from Rockefeller’s collection, but a pretty decent number of them are. The center also has a gallery of modern/contemporary Latin American art. The Lenora and Walter F. Brown Asian Art Wing (the big glass block in the left of the image above), which opened in 2005, is the other section that the museum is known for. Walter F. Brown was active in the oil and gas industry and founded a company called Delray Oil. The Asian Art Wing has thousands of artworks from China, India, Japan, Korea, Nepal, Pakistan, Thailand, Tibet and Vietnam. the Asian Art Wing has an extensive collection of Chinese ceramics. My own favorite, though, is the Art of the Mediterranean World section (the fist floor of the left-hand tower on the left of the above image). This is where our old friend Gilbert M. Denman, Jr., comes in. You do see his name elsewhere in the museum but quite a lot of the artworks, including the wonderfully restored statues of Marcus Aurelius and Trajan, were his donations. Denman (and others, I think) also donated a number of pieces of carvings from the “Amarna” period, which is when Akhenaten ruled Egypt. These pieces include at least one that I’m pretty sure is Akhenaten’s abdomen, and, my own favorite, solar rays that end in hands. Alex and my trip to New York City covered pretty much everything we did in New York City in 1988, with two exceptions. 1. the United Nations, and 2. The American Museum of Natural History. We fit a lot of things that we didn’t do in 1988 into our 2015 trip, though, and you can see them all under my 2015 Vacation category. So, today we’ll focus on the United Nations. At least in the United States, we tend to glorify World War II. At least in Europe, the United States was clearly on the side of the good guys. The Nazis were killing their own citizens by the millions. It’s really hard not to be on the side of the angels when your enemies are that bad. During the war, the “Allies” as they are commonly known (the countries that were fighting against Germany, Italy, and Japan) decided that they needed to find a way to avoid wars like this in the future. They began in 1941 with the Atlantic Charter, an agreement between the United States and the United Kingdom, and then about four and a half months later, 26 countries signed the Declaration of the United Nations. By the end of the war, the United Nations included 50 countries who signed the Charter of the United Nations in 1945. Of course, eventually Germany (then the nations of East Germany and West Germany), Italy, and Japan did join the United Nations. The stated goal of the United Nations was to avoid a conflict like World War II from ever happening again. As an attempt to avoid all wars, it has been a pretty spectacular failure. The United States, in particular, has taken up arms in Korea, Vietnam, Iraq, and Afghanistan, at the very least, in the years since 1945. Other countries have had their own conflicts, as well. Has it avoided World War III? Perhaps the situation hasn’t arisen that would have ended up being World War III, but I like to think that just maybe it has. Unless, of course, future historians decide that the conflict in the Middle East that began in 2001 and involves something like 40 different countries, has been World War III, which I don’t think is an impossible development. My own interest in the United Nations started in the 1970s, when Diana Prince (civilian alter ego of Wonder Woman) worked there. When I ended up being pretty good with foreign languages (a trait I inherited from my maternal great-grandmother, who spoke five), I thought about majoring in a foreign language and becoming a translator and perhaps I would have been good enough to get work at the United Nations. We’ll probably never know. As I told you in my previous post on our 1988 trip, I was beginning to date the man who is now my ex-husband at that point. I opted not to major in a foreign language because I knew that I was already only going to be able to see him every few weeks. I didn’t want to have to live in a foreign country for a semester (or more!) and miss seeing him for 16 or 32 weeks. 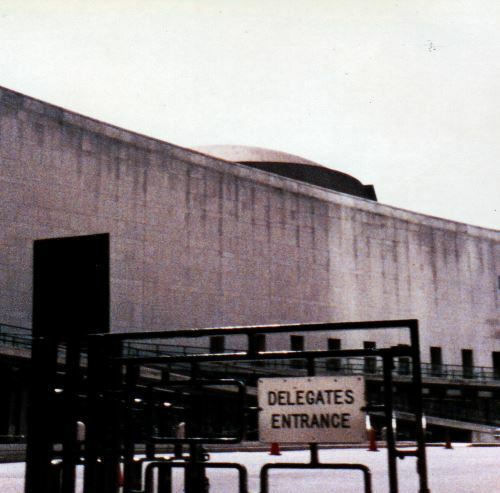 The old Delegates’ Entrance to the United Nations. This sign, at least, was gone when we were there in 2015. I think that the delegates now enter with everyone else. When we visited the United Nations in 1988, we walked from our midtown hotel to the UN building. We walked down 45th street, so close to Grand Central Terminal that we could practically touch it. Grand Central was on my list of places that I wanted to see in person, but we were on a schedule, so my folks and I kept walking. We made up for that in 2015. The original hope for the United Nations was that they would find someplace unclaimed by any nation to hold their headquarters. 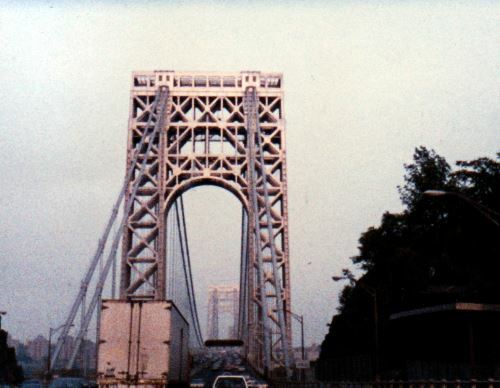 That ended up being impracticable, so they decided on New York City as the location. John D. Rockefeller bought an 18-acre parcel of land that used to hold a slaughterhouse and donated it to the United Nations. 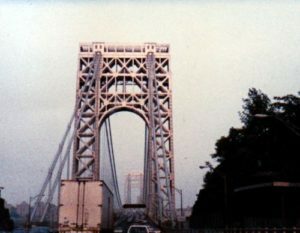 The United States ceded the land to the United Nations, so the headquarters is no longer part of the United States, though all of the laws that apply in New York City are enforced at the United Nations. The United Nations headquarters uses the US dollar as its currency, but it has its own stamps. When we visited, none of the various organs of the United Nations were in session. This was bad because we didn’t get to see any of the activities of the United Nations, but it was also a good thing because our tour guide was able to talk about the General Assembly and the Security Council and things in the chambers themselves, which made it more interesting. One of the most memorable parts of the tour, though, was the disarmament room. This room has various artifacts in it, most notably coins and a statue that were in Hiroshima and Nagasaki during the nuclear blasts there. Our tour guide told us that the delegates had to walk through that room to get to the General Assembly chamber. I don’t know if that was true then, and I am less certain of that now that the delegates apparently have to go through security with everyone else. Alex and I are planning a return trip to New York City as part of our 2017 trip to Canada (which I’ve already saved up for). The United Nations is going to be the top of our list of things to see if/when we do make that return trip. Remember the quarries in Brackenridge Park? The ones that were put there, at least in part, to support the production of cement? We’re still there. This area didn’t go immediately from empty land to quarry to park, though. For a period beginning in 1863, this area was a tannery. In 1863, Texas was part of the Confederacy, so the products of the tannery were used by the Confederate Army. This is why it’s generally referred to as the “Confederate Tannery.” I wish there were some photos from that era. It sounds like there was a quarry there, then a tannery, then maybe they did more quarrying, and then it became a park. There were cameras in 1863, so maybe someone took a picture of the tannery at some point, but if there is, I can’t find it. The San Antonio Zoo actually began, from what I can tell, three times. The first was a menagerie of sorts in San Pedro Springs Park. From what I’ve read, there was also a menagerie at the Hot Wells Hotel (post to follow, perhaps not until the planned county park opens, if that happens in the next couple of years). George Washington Brackenridge actually established the zoo in the park, with bear, buffalo, deer, elk, lions, and monkeys. An article I read years ago, and that I cannot find now, said that the menagerie at the Hot Wells hotel (which consisted of a bear and some ostriches at the very least) was moved to Brackenridge Park once Brackenridge set up his zoo there. Now the ex-husband and I have always been fond of zoos, and we heard good things about the San Antonio Zoo, so it was one of the first places we visited when we got here. We visited so early in our residence here, in fact, that we had no idea where we actually were going and we ended up going around the long way. I love the zoo, but be warned. A lot of the 750 species of animal at the zoo are birds. I stopped and counted it up and it looks like around 25% of the species are birds. I’m not sure if that’s more or less than for most zoos, but it feels like more. A lot more. Of the good, the San Antonio Zoo is a player in the attempts to breed the Attwater’s prairie chicken and the whooping crane. Actually, never mind. I found on the San Antonio Zoo’s website where they state that they have “One of the largest bird collections in the country.” So that answers that question. Definitely bird-intensive. Let’s see if you can guess what animals live here. Yep. Birds. This is the Hixon Bird House. In fact, that page on the website says “we participate in over 230 endangered species programs.” The prairie chicken and whooping crane are two. They used to breed snow leopards, as well. I think there was something else in the snow leopard cage the last time I was there, though. I wonder what the other 228 species are . . . .
One of the relatively recent upgrades to the zoo, and one that has gotten a lot of positive press, is their “Africa Live” area. This is an area that has a focus on, as it says on the label, animals of Africa. 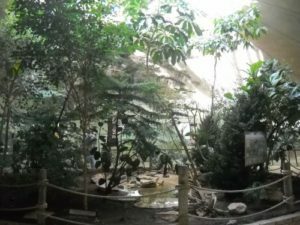 The entrance is an air-conditioned building that has primarily smaller animals, fish and reptiles and things of that nature. There is also a viewing window for pygmy hippos. Beyond that building is an open area with more animals, including a new (as of 2015) feature where for $5 you can feed three lettuce leaves to a giraffe. Speaking of interactive things (and also going back to the bird theme), the zoo also has Lory Landing, where you can feed nectar to lorikeets. The Rainbow Lories tend to be the friendliest, so of course, I always attempt to coax one of the more standoffish species onto my hand. What can I say? I’m a rebel. On the negative side, the zoo gets some bad press for Lucky, our one remaining Asiatic elephant. And, as much as I love the zoo, I do feel bad for her when I see her all alone in her enclosure. But the zoo has a page detailing her care, including the fact that the USDA, the Association of Zoos and Aquariums, and “third party agencies” have examined her habitat and routine and said that it is, at the very least, adequate, and sometimes more than adequate. She also has seven employees, including two full-time veterinarians, seeing to her physical and emotional health. The zoo has considered getting another elephant to be a companion for her, but they worry that, at the age of around 56, she is getting to the end of her life expectancy. The stress of adjusting to another elephant might have negative consequences for her health. At the moment, there is a lawsuit seeking to send her to a sanctuary, but, again, she’s getting old and separating her from the only home she’s ever known and changing her routine may well also be bad for her health. Personally, I don’t know why they would work as hard as they have to keep her (not to mention the expense of her staff!) unless they honestly believed, and were getting feedback from outside organizations they trust, that keeping her in her current situation is the best thing for her. June 27, 2016: Lucky now has a roommate. You can read the update I posted here. The zoo is open 365 days a year. Whenever I tell anyone this, I point out that they have to send people in to take care of the animals anyway, why not have a few more employees there and make a few bucks? And San Antonians take advantage of the fact that the zoo is even open on Christmas. Christmas of 2015, Alex and I went to the zoo and there were no parking spaces available. We ended up going downtown instead. Most of the paths at the zoo seem like they should be wheelchair accessible. I think that the steep uphill path in the Rift Valley area at the back of the zoo might be a bit much for wheelchair users. I’ve also heard that some of the restrooms are difficult to access, but I seem to recall a restroom in the Africa Live building that didn’t have the sharp 90-degree turns of the restrooms in other areas of the zoo.